About 10 days ago I read a text from Tim: "I have to go to a conference in Whistler. Can you come?" My first reaction was "no," but then I thought about it, checked with my principal, who said, "certainly." So I arranged for a TOC and last Sunday, Tim and I took the 11 am ferry to the mainland and drove to Whistler. You might remember it as one of the main venues for the 2010 Winter Olympics. It's in the most beautiful setting, in the heart of the Coast Mountains. The Sea to Sky drive showcases view after view of the ocean, snowcapped mountains, distant peaks, and more. I'm glad I wasn't the one at the wheel so I could just take in the scenery. The above photo is the view from our room, overlooking the hotel garden and pools (not visible) and Whistler Blackcomb ski runs. Tim was in conference all day Monday, so I had the time to myself. What to do? I could swim and lounge by the pool, or wander through town, or go off exploring one of the many trails in the area. I chose the latter. I set out in the morning along a biking/hiking trail around Lost Lake. There weren't many people about yet, and those I did see were on mountain bikes. These four little tykes looked so cute in their mountain biking gear. As the first one got on his bike and began pedaling up the hill, he called out, "Come on, boys!" I briefly spoke with the leader/guide about getting them started young. For awhile I wondered if Lost Lake was really lost, for it seemed a long while until I found it. I took a few meandering pathways that looked interesting and discovered the small lake above, unnamed as far as I could tell. Here is Lost Lake, found again. The weather was perfect, not too cool, nor windy. Spring lags behind in the mountains, but there were lovely emerging greens, tulips still in bloom, and the fresh scent of fir and cedar in the woods. For lunch I wandered into town and sat on a bench, people-watching, while I ate my salad. I find Whistler a not-very-interesting town. Its setting is gorgeous, with plenty of outdoor activities, but the architecture is all the same, and there is little evidence of the history of logging and the railway that opened up the area. However, people come from all over the world, and it's fun to watch and listen as the world passes by. This lovely corner is just by the hotel elevator and I sat there for a bit, enjoying the splendid view. Then to our room where I indulged in a novel (Joanne Trollope's "Daughters-in-law"), a cup of tea, and perhaps a little nap. When Tim returned, we went on another walk around Lost Lake again, on a more direct route that took less time. In all, I walked 12 miles that day. We ate a really lovely and delicious dinner, artfully presented, in the Wildflower Grill Room. Our table was beside a floor to ceiling window that looked out into a small garden where fat bees hummed among the pink rhododendron blossoms. For dessert we indulged in sharing a sticky toffee pudding with a rum cream sauce. I didn't see any bears or beavers or other wildlife along my walks, but there were a few wild flowers and delicate green shoots. I thought Proposal Corner was cute, and wonder how many proposals have taken place there. We came home Tuesday afternoon. It was a quick trip, but relaxing for me. A great little mountain escape. Oh, I have one blogging question. I've changed the template of my blog, but I can't get your comments to go to my email anymore. Have any of you had this difficulty? First of all, apparently blog comments not going into your email has happened to most of us - it has happened to me - it is 'blogger' messing us all about again. You had what looks like a perfectly relaxing time, I must admit that my very first love is being in hills, valleys, and mountains. Love those tiny mountain bikers all dressed up in their gear and raring to go. Those little bikers are so cute! Wonder if the little “come on boys” guy is a born leader. Beautiful location and you know just how to spend your time exploring...12 miles! So glad you were able to get away Lorrie, it does the soul and mind well to have a change of scenery now and then. I've been to Whistler, and although sometime has elapsed since that visit, I recall it being a beautiful area. You are amazing to walk so far in a day - I was thankful there were no bears! I've not much positive to say regarding the Blogger ups and downs and really can't assist you. I do know you are certainly braver than I - no way do I dare change anything such as my template, I'm terrified I would lose everything! My biggest problem right now is that Blogger doesn't scan the spam comments and put them in a separate 'folder' any longer - at least not for me. This means my spam comments are all intermingled with my regular comments and I have a more difficult time deleting them! I do of course moderate comments before publishing, however I don't really want to have to use the 'I'm not a robot" thingy too. we've still a lot a garden clean up to address since that flooding occurred - it's just rained daily for so long now and we're tired of it! The comment problem I've read a few sentences about, and quickly decided to wait until I read the words it has been fixed. Love your new template! There's no name at the bottom. I thought I had tried all the new Blogger templates. I missed this one. You are in great shape to walk so far! Such beauty to take in. I found this about blogger in a forum. We are aware that there is an issue where users are not receiving email notifications for comments. We're currently tweaking our emailing system, but we expect it to be working again soon. Thank you for your patience - we appreciate it! The scenery looks so beautiful there. Your captured it wonderfully. How wonderful that you changed your mind and said yes, I believe that we should all be open to every opportunity to travel that comes our way. 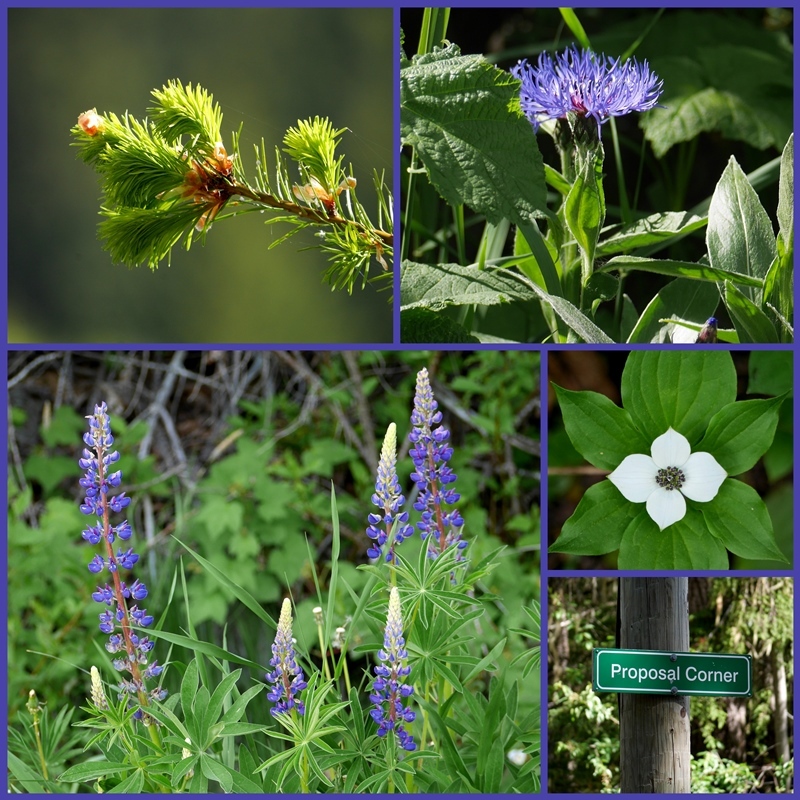 The scenery around Whistler looks amazing and your walk looked very interesting, especially the little boys with their bikes and Proposal Corner. I hadn't been aware of the blogger/comments situation but having checked gmail I can see none of today's MM comments have come through yet. I tweak my template quite often, usually replacing the header photo, I haven't changed the template for some time. I do like the one you've changed to. I'm glad you took time off to make this trip. We've not been to Whistler. It's great to see your beautiful photos! Those little guys on their bikes are adorable! What a very beautiful place to spend a couple of relaxing days. I do like your new look blog! I think we are all having problems with blogger, but I'm sure given time it will sort itself out. A beautiful post, what a lovely place. I've had the same issue with the e-mail notifications. Hopefully, it'll get resolved soon! Oh...glad you changed your mind and your work said yes, go. What lovely things you got to see. What a fabulous trip. We have been to Whistler one time - just before the Olympics, and there was serious road widening construction going on. We got a late start and ended up driving the curving winding road in the dark - often with no lines on the road to direct our path. On the way home we were driving in the daylight and were scared silly to see what we had actually driven through that first night - had we known it was so dangerous (no guardrails - no warning signs - no road edges to keep up from going over) we certainly would have waited until morning. But it was a grand visit. Our impression of the town was similar to yours - but we did find wonderful places for viewing nature - and there was a bike race that day - the entrants would take their bikes up on the ski lifts and then race down the mountain - we saw them at the end - all of them carrying their bikes on their shoulders - we asked one of them why they carried them and he said they had had enough of sitting on a bike and besides - the bikes were often beaten up so badly from coming down that mountain that they couldn't be ridden until repaired. I'm glad you got to have such a nice visit - the photos are wonderful - and just loved the little mountain biking boys. All of a sudden my comments have stopped coming to my email also - and I changed nothing on my blog - I think it is something that blogspot has done to our accounts - and I don't like it - as I can't reply to the comments. Hope your week is grand - school is out on the 14th here - when do you get out? Graduation is on the 27th, but classes are done on the 19th. Everyone is beginning to count down the days! Oh Lorrie, I am so glad that you decided to go with Tim! What a wonderful little getaway that you were able to enjoy. Your photos are stunning, and the one of the little boys just tugged at my heart. Your trip sounded like a perfect, restful, reflecting time away from all the humdrum of life. What a perfect little getaway! A rest for the mind and spirit, if not for the body. Twelve miles, girl! Wow! Gorgeous scenery! Beautiful scenery! I'm glad you were able to go! The commenting issue is not template related. We're all dealing with it! What a wonderful escape! You couldn't pick a more beautiful spot to just relax and "be". I love people watching ... a good book ... and a nap! All precious in my book. Have a fun-filled week. How great that you were able to join your hubby for a little escape to Whistler. It's one of our favorite places to go! Always a great place to rest and relax....and get re-energized. As the saying goes, no-one is on their deathbed wishing they had worked more! So, good for you getting away with Tim! It looks like my kind of place with mountains, water and flowers! It is on our list, and I am even more convinced than ever with your tour! I am surprised that one of the comments above indicates that Blogger plans to fix the comments issue - I thought it was irrevocable given requirements they have to protect privacy … oh well, in the meantime, I am enjoying visiting my blog dashboard to see multiple comments that have accumulated … I am starting to think this is more fun than getting them one at a time! And I like your new format! Now that sounds like a perfect impromptu get away. I would love visiting there. The little biker boys are so cute too. Oh, lovely post! Makes me want to go there. What a lovely break, Lorrie, I'm so glad you decided to go. What a lovely getaway! The views are beautiful and your time at the hotel sounds good too. The new look of your blog is lovely, fresh and modern. Such a nice, relaxing little get-away. The scenery is so beautiful. My children ski at Whistler every year and my son proposed to his wife-to-be there. I don't ski, so have never been, but I would love to go this time of year. Your husband must have appreciated your being there at the end of a long day!